social structure, conservation. Cougar images, videos and top Facts. The Cougar is a member of the feline family and they go by many different names. In some areas they are referred to as Mountain Lions. They are also called Pumas in other locations. The term Cougar is one that is very loosely used in association with these types of wild cats. The Cougar is found in a variety of different habitats which is why they are considered to be so versatile and adaptable. They have a huge habitat range which does make it hard to keep track of how many of them remain in the wild. They are very good hunters with powerful jaws to be able to take down their prey. The overall size of them varies so they range from 115 pounds to 265 pounds. They are able to take down prey that is several sizes larger than they are. There are many things about the Cougar that fascinate us. They are one of the fastest land animals in North America. This gives them amazing opportunities when it comes to getting their prey. The Cougar is a loner both in they way it lives and when it hunts. When a pair is together for mating they will soon depart from each other. The males can travel very long distances and even fight with each other for the right to mate with the females. The mothers are very good with their young cubs. They will nurture them and teach them how to hunt for the first couple of years of life. The Cougar doesn’t have the ability to roar like some wild cats. However, it does use a variety of sounds to communicate for mating and while caring for young. These sounds include hissing, growling, and chirping. When they want to call for each other they will give off what sounds very similar to human screams. They are also the largest of the felines with the ability to purr. The future for the Cougar is one that is very uncertain. The fact that humans continue to deplete the territory where these animals live is a huge problem. It continues to be an issue that threatens their future existence. Even though there are conservation efforts in place it does make it very hard to get their numbers back up. Still, they are considered to have the lowest threat of possible extinction compared to other felines. The tail of a Cougar can be about 3 feet long. It helps to keep them balanced. The Cougar is genetically closely related to the Cheetah. 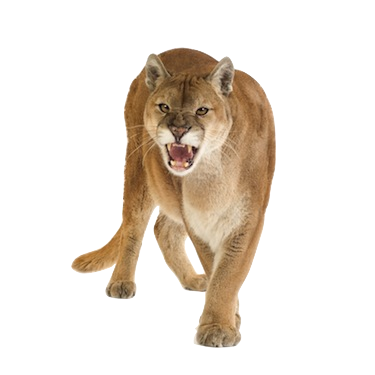 One of the biggest problems with humans invading the space of the Cougar is that they are deemed as being dangerous. People are very afraid of attacks from such wild animals. There are also farmers and ranches furious with the fact that the Cougar will also hunt their livestock. In the state of Wyoming the Cougar had a huge increase in the population between the mid 1960s and the early 1990s. That is a thrill for conservation but also creating more tension among them and humans. Coming to a conclusion where humans can be happy and these animals can have their habitat continues to be a battle that has no easy answers. It is estimated that there are approximately 50,000 Cougars remaining in the wild. One of the issues that humans have is that attacks on humans by the Cougar have increased in the past decade. This is due to them becoming closer and closer to areas where these animals live. The attacks are often fatal and most of them are on children or very small women. When hiking with children they should stay between adults and not be allowed to go up ahead on their own.